This colorful and kid-friendly, 20-minute meal features easy-to-use ingredients, like microwaveable rice and canned vegetables, making it both a convenient and affordable dish. 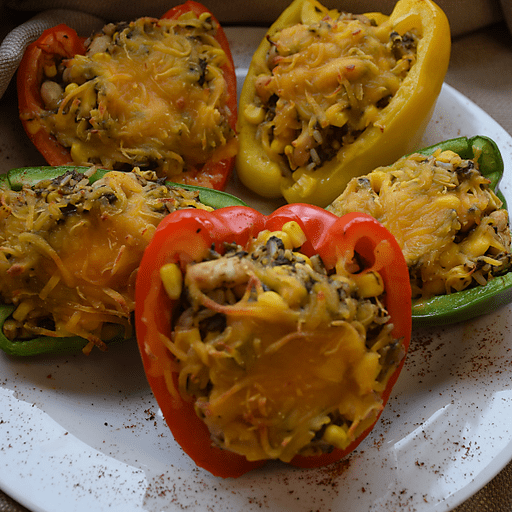 You can even recruit your child’s help when stuffing the peppers or adding the cheese topping to create a fun, family, meal-prepping activity! 1. Prepare Steamfresh® Whole Grain Brown Rice according to package directions. 1. Cut peppers in half lengthwise. Remove seeds and membrane. Brush peppers inside and out with olive oil. In a large bowl toss rice with beans, tomato sauce, spinach, corn and ¾ cup cheese. Toss to mix well. 1. Preheat oven to 425°F. Fill each pepper with some rice mixture, mounding slightly. Top with remaining ¼ cup cheese. Roast peppers 10 minutes or until peppers are softened and cheese is melted. For dairy free: Omit cheddar cheese. Calories 520, Total Fat 16g (Saturated 7g, Trans 0g), Cholesterol 30mg, Sodium 187mg, Total Carbohydrate 76g (Dietary Fiber 12g, Sugars 10g), Protein 23g, Vitamin A 210%, Vitamin C 250%, Calcium 40%, Iron 30% *Nutritional values are an approximation. Actual nutritional values may vary due to preparation techniques, variations related to suppliers, regional and seasonal differences, or rounding.